SO1: To support the varietal behaviour in a variety of agro-climatic zones in terms of cost and production cycle. SO2: To optimise the agronomic management by understanding the incorporation of specialized machinery in the processes of sowing, transplanting and fertilizing. SO3: To analyse and refine quality standards to ensure the safety of the final agriculture based product under high risk and uncertain conditions. SO4: To evaluate the environmental conditions for enhancing soil management technologies and planting management. SO5: To model and optimise smarts and innovative collaborative production-transport planning solutions of horticulture products across the full value chain structure. SO6: To generate horizontal and vertical knowledge exchange mechanisms across the agriculture value chain. GO1: Draw together outstanding academic research teams from Europe and South America, with the benefit of achieving synergy from their diverse multidisciplinary skills and expertise in the field of agronomy, agriculture, uncertainty, risk, supply chain and logistics. 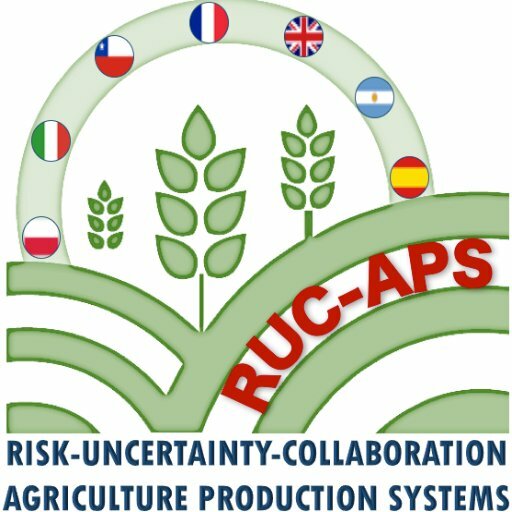 GO2: Build joint collaborative projects for the development of sustainable international agriculture management under high risk and understanding with high efficiency, resilience and integration in terms of risk and cost that are subjected to various unpredictable environments in a variety of latitudes. GO3: Create a platform for research training and transfer of knowledge activities, both within the network domain and towards the public domain, crossing inter-sector boundaries to ensure that there are a sufficient number of people trained in this highly demanded field to handle the challenges ahead, and to ensure the EU‟s leading position in the world in combination with the whole high diverse expertise. GO4: Disseminate knowledge to the larger international communities to maximize the impact of this network, and ensure the academic, industrial and governmental relevance of its research activities. GO5: Provide researchers, in particular at an early stage in their careers, with intensive training-through- research programmes as well as complementary skills training, in order to become trainers of the future in a multidisciplinary field of academic, industrial and societal importance, and by so doing improving the career prospects of young researchers. GO6: Establish collaborative mechanisms for long-term partnerships between European and South American researchers and institutes on the resilience and sustainability agriculture management enhancement of integrated information communication technologies based systems in order to support value chain participants decision- making process under high risk and uncertain conditions, where small and medium farmers will be able to interact better with issues likewise the climate change, unpredictable environment and economical conditions, increasing economic upheaval and other challenges for the 21st century in the agribusiness and innovation approaches.